045.J.R.Carpenter – JavaMuseum 2010 – Celebrate! J. R. Carpenter is a writer and web artist based in Montréal (Canada). She began using the Internet as a medium in 1993 and since that time her work has been exhibited internationally. I moved to Montréal on the night train. I’ve lived in eight neighbourhoods since and each has had a different quality of sleep. There are eight hours for sleeping in. There are four quarters in an hour. There are many more quarters in a city. Some quarters never sleep, or so they say. Others seem to be built for dreaming in. These are les huit quartiers du sommeil de Montréal – 1990-2006: Car Crash Sleep, Bamboo Blind Sleep, Waterbed Sleep, Louvered Door Sleep, Purple Parakeet Sleep, Break and Enter Sleep, Gondola Sleep and Greek Sleep. There are a number of ways to find these neighbourhoods of sleep. You can take the night train to Montréal (warning: this method may take 16 years). You can do a Google Maps search for “J. 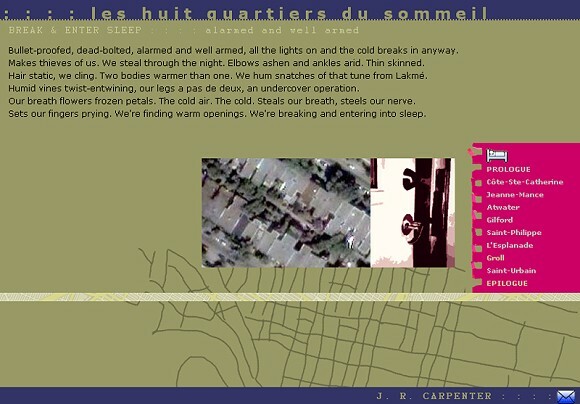 R. Carpenter les huit quartiers du sommeil de Montreal 1990-2006” and view user generated content (warning: this method may return variable results). 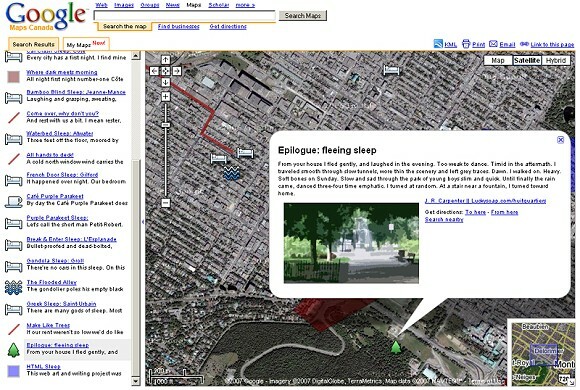 Or you can follow the direct link to the Google Map of les huit quartiers du sommeil here: http://luckysoap.com/huitquartiers I wrote the text of les huit quartiers du sommeil at Yaddo January-February 2007 and built the Google Maps and HTML versions in Montréal May-July 2007. The aerial photographs are totally copyright Google Earth. The other images were found using Google Images and then altered using Photoshop filters until they looked like something I would do. Except for the street maps, those I drew by hand as you can probably tell. Thanks in advance to Google Maps for having a sense of humour. Merci Daniel Canty, your English is better than mine. Thanks everyone at Yaddo who listening to this text coming to life. Thanks Sandra Dametto, for the brilliant idea. Thanks Michael Boyce and Lisa Vinebaum for your careful readings. And thanks for everything Stphane Vermette. 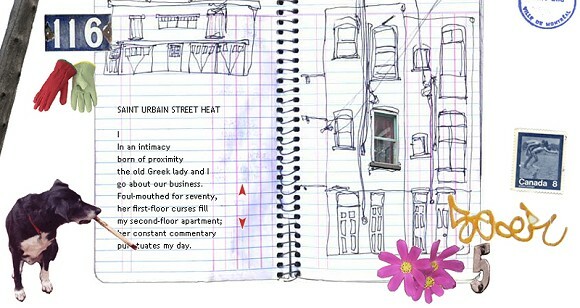 Entre Ville is a web art poem about my back alleyway. I work at home. My studio window opens into a jumbled intimacy of back balconies, yards and alleyways. Daily my dog and I walk through this interior city sniffing out stories. Poetry is not hard to find between the long lines of peeling-paint fences plastered with notices, spray painted with bright abstractions and draped with trailing vines. Entre Ville is presented in the vernacular of my neighbourhood, where cooking smells, noisy neighbours and laundry lines criss-cross the alleyway one sentence at a time. 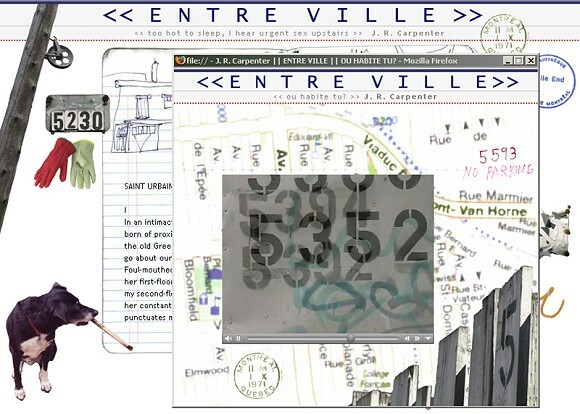 Entre Ville is based on my poem, “Saint-Urbain Street Heat” which was first published in the UK online literary journal NthPosition.com, and in now archived in The British Library’s permanent collection in association with the UK Web Archiving Consortium. The web iteration of Entre Ville was commissioned by the OBORO New Media Lab on the occasion of the 50th anniversary of the Conseil des arts de Montreal. It launched at the Musee des beaux-arts de Montreal, April 27, 2006 and has since been presented at MiT5, a conference at MIT, Cambridge, MA, USA, and included in the Rhizome ArtBase at the New Museum of Contemporary Art, NY, USA, and the Web Biennial 2007 at the Istanbul Contemporary Art Museum, Turkey. 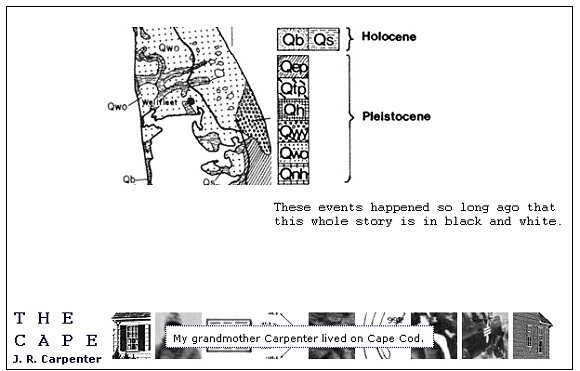 How I Loved the Broken Things of Rome as a neo-classical web site. It pieces together fragments of history, poetry, video, photography and cartography collected during an extended stay in Rome. It reflects upon certain gaps – between the fragment and the whole, between the local and the tourist, between what is known of history and what is speculative. Just as in Rome three thousand years of continuous occupation have produced one of the most deeply stratified and complex urban sites in existence, How I Loved the Broken Things of Rome fuses together fragments from the history of web programming and imaging technologies, from the most basic HTML to advanced DHTML scripting. The result is a highly subjective quasi-fictional intertextual dialogue that recycles bits and pieces of existing Web technology to echo the stratified condition of my subject matter. In this investigation of dislocation, romanticism, and the fragmentary nature of language in the modern, corrupt, confusing, ruin-strewn and tourist-thronged city of Rome, the only way I found to present a comprehensive visual and textual narrative was by embracing contradictions. 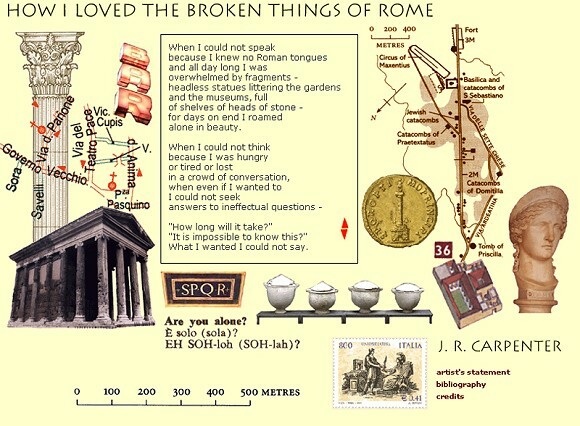 How I Loved the Broken Things of Rome was created in Rome with the support of Barbara Catalani, and in Montreal with the financial support of the OBORO New Media Lab artist in residency program and a Development Grant from the Conseil des art et des lettres du Quebec. 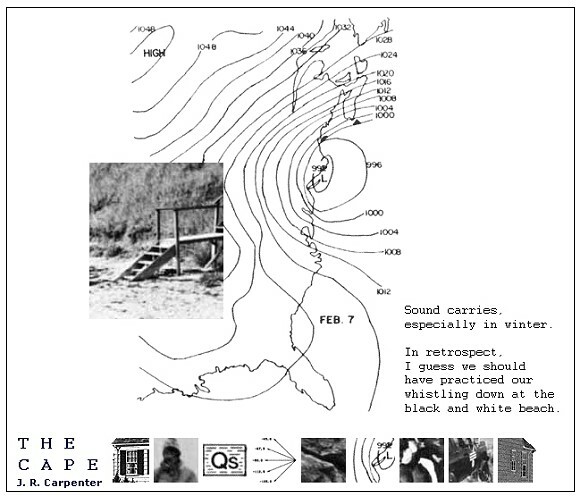 It has since been included in the New Geographies Project, Mexico City and the Rhizome ArtBase at the New Museum of Contemporary Art, NY, exhibited at the Museum of Contemporary Canadian Art in Toronto, in association with the 19th Annual imagesFestival, and named a Web Art Finalist in the Drunken Boat PanLiterary Awards 2006.